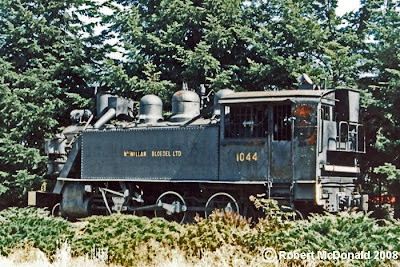 MacMillan-Bloedel, Ltd 1044, Chemainus, BC, July 1988. We had taken a trip over to the West Coast of Vancouver Island to take an overnight cruise on the M/V Uchuck III. It is a really neat trip from Gold River to Kyuquot – a trip I would highly recommend to you, provided you could get a USDA Food Loan for gasoline! On the way home, we traveled down the east coast of Vancouver Island toward Victoria, passing through many colorful and historic towns, including Chemainus. Low and behold, just of the highway, I spotted Mac-Blow (common reference to MacMillan-Bloedel lumber company) 1044, a doughty little 2-6-2T. Chemainus was once a thriving logging and mill town, which, like many towns and villages, had to “re-invent” themselves when the timber declined. Chemainus is now a interesting artist community, well known around the world for its massive murals, which take up the entire sides of many buildings! It is quite a sight to behold, and cameras are constantly clicking around you! Locomotive 1044 marks the end of an era. Stream railway logging in British Columbia began and ended here in Chemainus. July 19, 1877 – December 1, 1969. 82 years, 4 months, and 12 days. 30,085 glory days of steam. Here she is in a more recent photo, showing her new and accessible static display (note no chicken wire fencing!) A curiosity to me is the box and tubing just behind the stack. I suspect it is part of a complex spark arresting system, yes? I would encourage you to check out the significant collection of MacMillan-Bloedel logging photographs! Railroad Stuff: MacMillian-Bloedel, Ltd. 1044, 2-6-2T. Built for Timberland Development Company #4, by Porter Locomotive Works, boiler number 6877, in 1924. Subsequent owners include Victoria Lumber Company and MacMillan-Bloedel.